“I look in the mirror and see an old woman.” This was the comment of one of my friends, a young Mom in her 20’s, during the first year of her son’s life. She is not alone in feeling this way. The thing is, Moms are usually so busy caring for their spouses and children, they have very little time to care for themselves. Perhaps this explains why the Beauty Industry was founded and why the Anti Aging industry has taken off like wildfire. I started taking StemEnhance just after an appendix operation, to speed up and assist the recovery process. I felt so happy on the StemEnhance that I kept taking it for 5 years, until I became pregnant with my son. I literally mean happy. AFA in Stemenhance contains PEA (phenylethylamine), in much higher doses than it’s found in chocolate. PEA is what makes chocolate a natural anti-depressant. StemEnhance is doing a lot more good internally than just making you feel good, however, its also supports the body’s natural renewal system by increasing the number of stem cells released into your bloodstream. What this means is that it can help you heal faster & prevent or even reverse degenerative illness. For a more detailed explanation, see my article, Natural Anti Aging Products. Buy Stemenhance and Stemenhance SE2 on Amazon, or directly from Stemtech at wholesale prices. 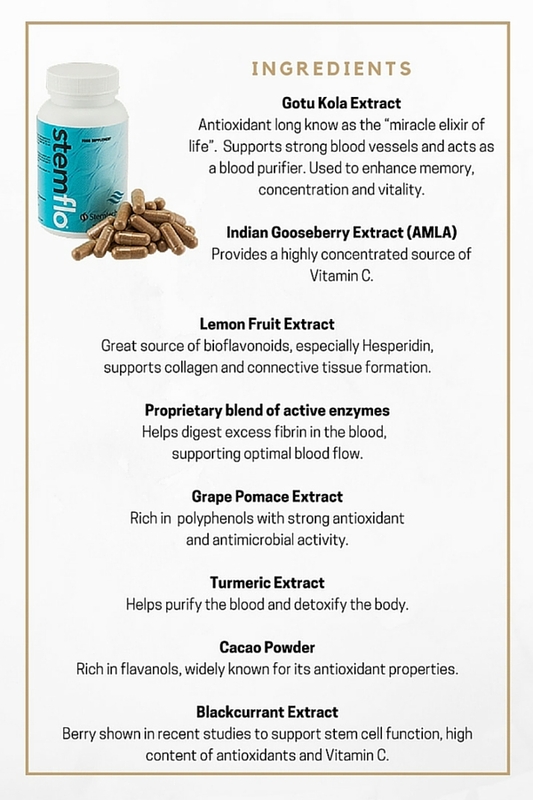 Stemflo is an all-natural proprietary blend of herbs, botanicals and nutrients. StemFlo is especially designed to improve circulation, supporting the delivery of nutrients, oxygen and immune cells throughout the body. 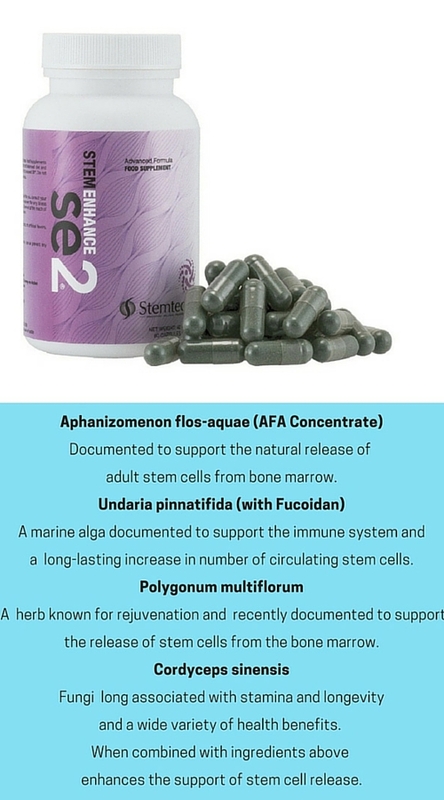 When used in tandem with SE2, StemFlo optimizes the body’s ability to deliver and circulate adult stem cells to tissues and organs in need, thus supporting optimal health and well-being through stem cell nutrition. Buy Stemflo on Amazon, or directly from Stemtech at wholesale prices. Fortunately, help is at hand for the skin at least, in the form of Dermastem, an all-natural serum to restore and maintain your skin’s youthful vibrance. 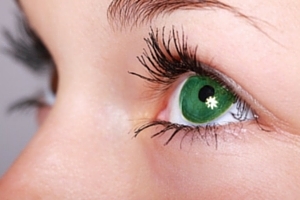 Studies show 25% Fewer wrinkles, 30% More Moisure, 10% more elasticity in 28 days. 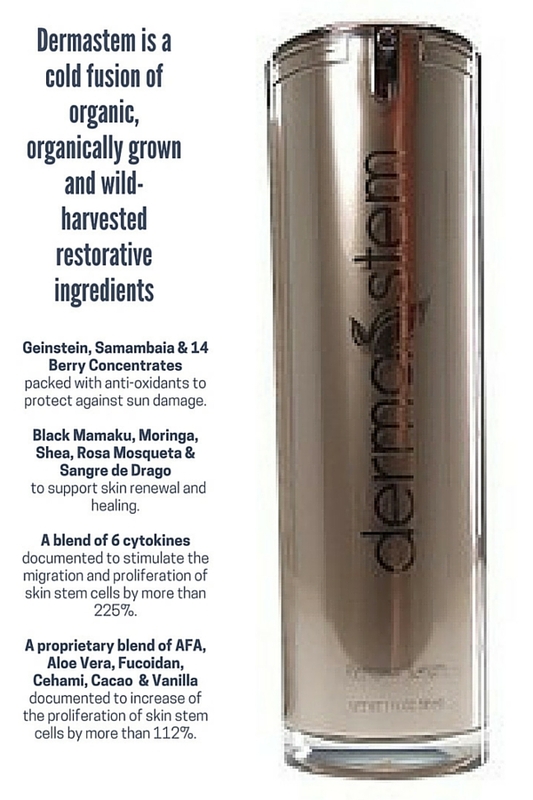 Dermastem is a cold fusion of organic, organically grown and wild-harvested restorative ingredients. It’s important to note what’s NOT in Dermastem. Dermastem contains NO petroleum derivatives, preservatives or chemicals. I keep mine in the fridge and use it after cleansing and toning, morning and night. It’s best to wait a few minutes before applying day or night cream. Buy Dermastem on Amazon, or directly from Stemtech at wholesale prices. 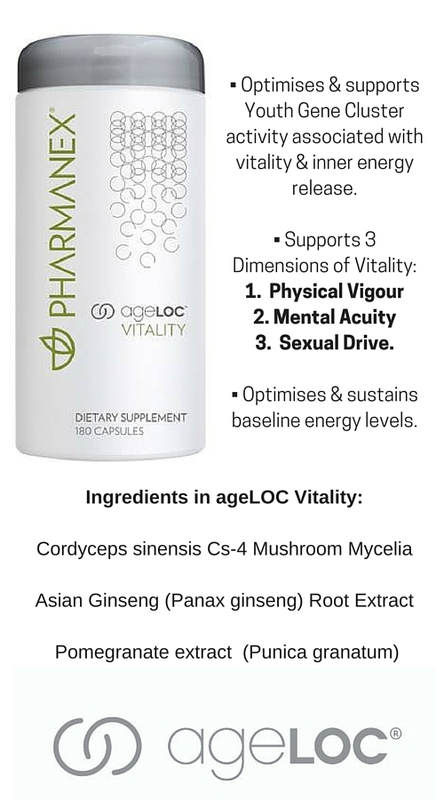 Interesting to note that Cordyceps sinensis is in both ageLOC Vitality AND SE2. 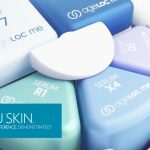 Fortunately Nu Skin also has a brilliant Anti Aging skin care range, also called AgeLOC and they recently launched AgeLOC Me – customised skin care, based on who you are, where you live, your daily exposure to pollution and sun, your skin type, response to other products, and what your skin looks like. Take the Assessment here. In the first year of my son’s life, a very kind friend of mine in Ireland, Jackie Carroll, sent me some products and I thrived on them for a few months. Alas, the import costs made the products prohibitively expensive so I have to do without until the company launches here. Juiceplus is the only product in its kind that I could find for pregnant & nursing Moms. In fact, Juiceplus is just food, so its even safe for children. The children’s chewables are also available on Amazon. So… for this brief period of my life (while still nursing Benjamin) I have to content myself with skin care only as my anti aging regimen, as well as a healthy lifestyle: let’s not forget the value of laughter, regular exercise, meditation, drinking lots of water & eating a wide variety of fresh, colourful foods. Moms, do you feel you’ve aged since you’ve had children? What do you do to look and feel younger? Hello here. Thanks for the informative and comprehensive article about benefits of antiaging supplements. I guess that everybody wants to be in good shape and perfect state of mind till we are here, on this precious Earth. I checked ingredients and saw that all they benefit bodies in one or other way. I big fan of Cordyceps Sinensis. This half mushroom, half animal creature strengthens lungs, kidneys, provides better oxygen delivery to cells. Most if your mentioned ingredients in these supplements work as antioxidants. It means that they prevent our bodies from free radicals. Thanks again for introduction of anti aging supplements. Hi Nemira, thanks so much for your in-depth comments. Gee, you really did your homework. Much appreciated. Love your niche, so inspiring especially with the mums trying to make a living. I have four children, two girls and two boys. As a single mum, I always want to work from home but I still got my four day job so looking forward to working from home maybe in two or three years time. 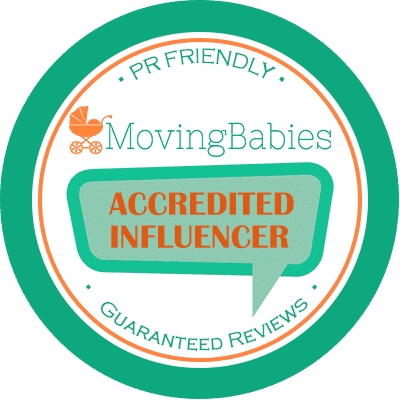 Your inspiration that you put into your site will encourage mothers out there that they can do anything only if they focus on doing something for themselves and make a living from home. I enjoyed reading your articles and Loes, what an amazing woman!! Hi Sila, thanks so much for your wonderful comments. Wow, four children and working four days a week, while setting up your own online business, that must be quite a juggling act! Awesome that you are working towards your dream of working from home, hope we can continue to inspire you and assist you along the way. Hi, I agree with you that the best way to keep healthy, young and beautiful is the most natural way, that is like what you said – laughter, regular exercise, staying hydrated and eating wide range of fresh and colourful foods. I also agree that supplements are necessary as we are not possible to consume all the nutrition that our body needs. Have you heard of Usana? To me and from many rankings & researches, it is the best company that produces the best supplements. If you’ve heard of it or tried it before, what do you think about it? Hi Jerry, thanks. I haven’t heard of Usana before, but will definitely do some research into the company and let you know what I think. Wow, I felt like I was reading something that’s the closest thing to the fountain of youth. 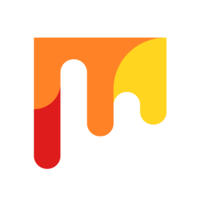 I just thought I’d say that I was impressed by this site and would like to say thank your for posting this. I was wondering if you can tell me if this also works for guys. And, if so I might just start with ageloc as I would want to slow down the aging process as much as I can. Hi Armand, thanks for your positive comments. Absolutely, the products work for anyone needing to slow down the aging process.